Estrangement or partial estrangement from an adult son or daughter is one of a parent's worst nightmares. It can mean angry silences and anguished days and nights wondering what went wrong. Becoming estranged from a parent can be equally painful for an adult child, who may miss the relationship they once shared. Families deserve clarity and understanding. 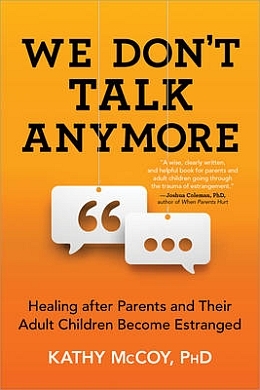 We Don't Talk Anymore will show you those first steps toward healing. Dr. Kathy McCoy is the author of the ALA-award-winning The Teenage Body Book. As a journalist, she has also written extensively for most of the major women's magazines as well as Reader's Digest. McCoy is a licensed marriage and family therapist with a master's degree in clinical psychology and a Ph.D. in human behavior. Click here to read previous issues.